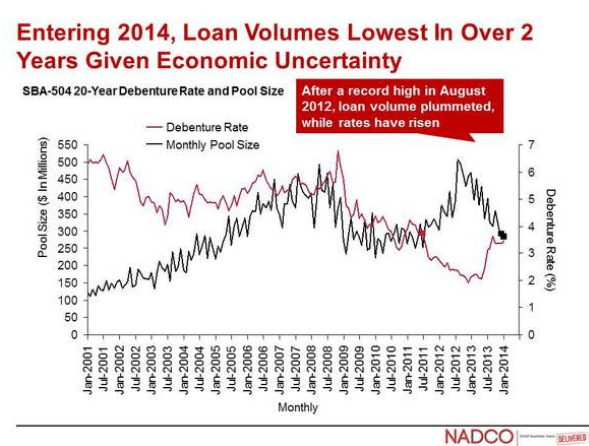 WASHINGTON, DC –The National Association of Development Companies (NADCO) Small Business Lending Report (SBLR) showed an overall decrease in volume of this month’s commercial real estate and equipment finance loans to small businesses, reflecting a declining demand that is a result of rising economic uncertainty and termination of the Small Business Debt Refinance Program. There were 444 businesses funded in January 2014 (as compared to 424 in December 2013), more than 20% under the 12-month average in 2013 of 561 loans. The 20-year monthly loan pool size was $283,660,000 — below the 12-month average in 2013 of $370,206,417 and a nearly 40% drop from $469,708,000 a year ago in January 2013. This month’s debenture rate rose to 3.46% compared to 2.13% a year ago in January 2013, and is also much higher than the 12-month average in 2013 of 2.76%. Interest rates are also significantly higher than last year’s 2013 average and will likely continue to rise in the wake of the Federal Reserve’s announcement in December 2013 to begin unwinding the massive stimulus that the Fed had pumped into the economy since the financial crisis and subsequent recession. Throughout 2014, the Fed will reduce its purchase of government bonds and mortgage backed securities by $10 million dollars each month. Additionally, the void created by the expiration of the Small Business Debt Refinancing Program is taking its toll on small business owners across the country.